If you’re looking to safeguard your home, family, and property, then we would like to introduce you to the Electronic Watch Dog. This electronic safety system has been designed to mimic the sounds of a large, angry dog whenever it senses nearby motion. You know that burglars and intruders don’t want to deal with a big animal. They want easy targets that won’t give them any issues. From outside, it sounds like you have a very unfriendly canine inside. A burglar isn't going to want to tangle with a large German Shepard inside the house. This is an excellent way to deter burglary, theft, and robbery. Now you might be wondering how an electronic dog bark is really going to fool intruders. Don’t worry because we’ve thought of everything. This system is constantly on the alert with modern motion sensors that can detect motion even through solid objects like trees or concrete. It can sense motion within 10-20 feet, depending on how you set the Barking Dog Alarm. Once it senses movement, the alarm gets to work with a very loud, very real dog bark. What’s best is that this is a smart alarm. If someone gets closer, then the barking will change to become louder, more frequent and certainly angrier. This will fool many intruders into believing that there really is a huge dog on the other side of the door just waiting to rip their leg off. You obviously don’t want this fake angry dog alarm barking all the time, especially when you are expecting company. While you could turn the alarm off, the other thing you can do is change the setting and a pleasant chime will go off instead of a bark. You can also adjust the volume and distance sensitivity. You don't want to scare off your welcome visitors, do you? The fake barking alarm can be plugged into any outlet so that it has an unlimited amount of energy, ensuring it’s ready whenever it’s needed. You can also install 8 AA batteries and we highly suggest you do. While the batteries aren’t needed if the alarm receives power from the outlet, sometimes the power goes out or there are problems with the plug. Using batteries will ensure that it can still work reliably. Another great thing about the Electronic Watch Dog is that you can install additional motion sensors to the alarm, up to 16 other sensors! This allows you to get an even further radius of coverage. We’ve thought of everything with this alarm to ensure that it works as well as possible. Even you’ll be surprised by how realistic it sounds, and you even know it’s there! If you want to keep your home safe with ease, then the Electronic Watch Dog is ideal. It’s easy to use and it responds to movement, ensuring that the barking and sounds are as realistic as possible. Hopefully, you never have an intruder, but if so, this will help keep them away. To recap, this is a unique security alarm that "senses" when someone is approaching the front door. Once it does, this electronic wonder begins barking like a large angry canine. The person or persons coming up to the home will know the place is protected and is not empty. If they continue their approach, the "dog" barks louder and more ferociously letting anyone know they aren't getting in that easily. This multifunctional Dog Barking Alarm system uses an electronic radar-wave sense control. This technology allows it to "see" through wood, cement, brick, glass, etc. 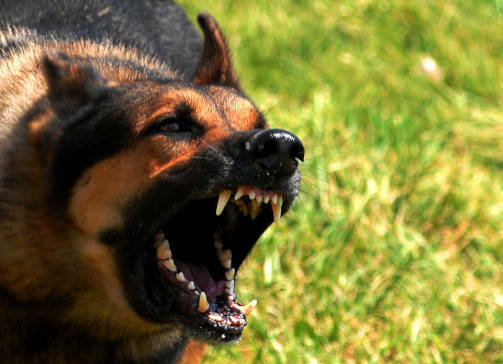 When an intruder enters the triangle of protection, it automatically begins barking like an angry dog. The radar sensitivity is fully adjustable from 10-20 feet. The volume is also adjustable. This device stands 9 inches tall and is powered by an AC power supply. Can use 8 AA back-up batteries (not included) in case of power loss. The included remote control lets you Arm and Disarm the system, as well as set off a Panic alarm. Can add up to 16 additional sensors to monitor larger areas. Switch from watchdog mode to a chime with a simple adjustment. Sense movement through walls, doors, and glass to alert you of a visitor's arrival. Very Realistic - barking gets louder and more frequent as an intruder gets closer. Protection with none of the problems of owning a real pet.